Condolence: Offering my sympathies to David's family. I worked with David for a number of years and it was a privilege to know him. He was one of the nicest people, always kind, always helpful. He will truly be missed. Condolence: Samantha and Megan, we were always impressed that your Dad shouldered his responsibility for the two of you, always willing to take you to your sports events or concerts, running errands on your behalf, always maintaining a home for you.... But more than responsibility, we saw that he dearly loved you both. We trust that you will cherish his memory. We were very sorry to hear about the passing of your father. We knew him during his P&G days and spent a lot of time on sports teams, hanging out, etc. He was a wonderful, kind man with a great sense of humor. He will be missed. 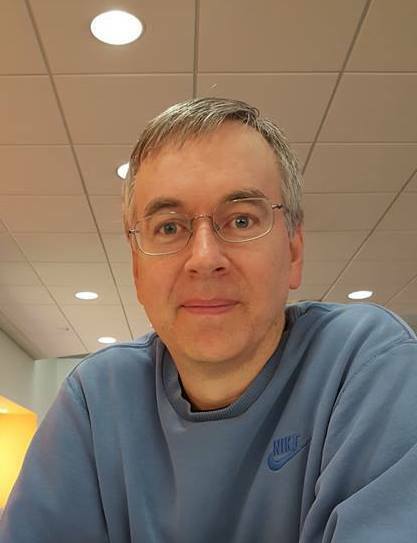 Condolence: I worked with David at Elsevier for just two short years but he made an impression on me with his perennial good nature, patience, and kindness toward all. I imagine he made the same impression on many others throughout his life. My condolences to those closest to him. Condolence: We were shocked and saddened to hear of David’s passing. I worked with him at Elsevier and he was a skilled and committed software engineer. But more than that, I also knew him to be a loving father who often spoke with pride of his daughters. He will be greatly missed. Condolence: We are so very sorry to hear of David's passing. His kindness and gentleness were always evident and as was his deep love for his daughters. Condolence: I spent quite a bit of time with David when we were young, as our families where close friends. His sister, Pat, was my babysitter and I eventually was David's babysitter. As a young boy he was inquisitive, mischievous, creative and a "pesky" little brother to Pat and Nancy. He was always "inventing" things to play with. I am so sorry for your loss. Condolence: Samantha and Megan, my heart goes out to you. I know the people who worked with your father - myself included - are shocked and we are sad, but your loss is simply unimaginable. Your Dad was such a brilliant, warm, and steady light in this world, and he will surely be missed by anyone fortunate enough to have known him. You are in my prayers. Condolence: We can't believe that David is gone; we are so very sorry for your loss. We saw him often when his mom was our backdoor neighbor - he would visit and keep us updated on his girls, who he loved so very much. I know he loved his sister and her family, too... David was a special, generous, kind man and will be missed by many. We are so sorry. Condolence: I worked with David at Elsevier. He was a very skillful developer and passionate about his work. He spoke fondly of his daughters and I know they were the lights of his life. He will be missed.